দুওরানীর চোখের জল, গায়ের ধুলো মুছিয়ে বানর বললে—এই দেখ্‌ মা, তোর জন্যে কি এনেছি ! তুই রাজার রানী, গলায় দিভে হার পাসনে,কাঠের মালা কিনে পরিস, এই মুক্তোর মালা পর ! রানী বানরের হাতে গজমোতি হার দেখে বললেন—এই হার তুই কোথা পেলি ? এ যে রাজার গলার গজমোতি হার ! যখন রানী ছিলুম রাজার জন্যে গেঁথেছিলুম, তুই-এ হার কোথায় পেলি ? বল্‌ বানর, রাজা কি এ-হার ফেলে দিয়েছেন, রাজপথে কুড়িয়ে পেলি ? বানর বললে -না মা, কুড়িয়ে পাইনি । তোর হাতে গাঁথা রাজার গলার গজমোতি হার কুড়িয়ে কি পাওয়া যায়? রানী বললেন— তবে কি রাজার ঘরে চূরি করলি? 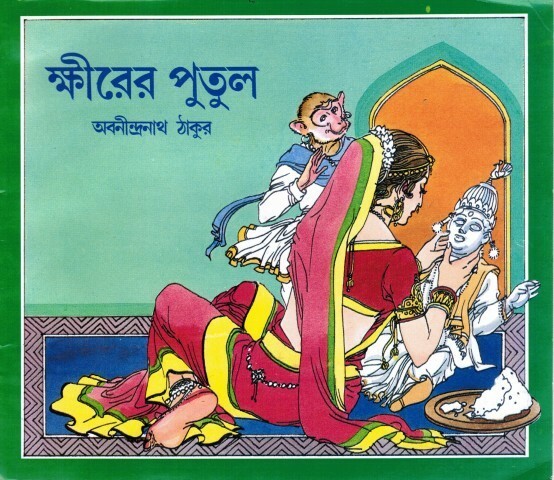 রানী বললেন-ওরে বাছা, তুই যে দুঃখীর সন্তান, বনের বানর । ভাঙা ঘরে দুঃখিনীর কোলে শুয়ে, রাজাকে দিতে কি সুখের সন্ধান পেলিযে রাত না-পোয়াতে রাজবাড়িতে ছুটে গেলি! বানর বললে— মা আমি স্বপ্ন পেয়েছি আমার যেন ভাই হয়েছে, তোর কোলে খোকা হয়েছে; সেই খোকা যেন রাজসিংহাসনে রাজা হয়েছে। তাই ছুটে রাজাকে খবর দিলুম-রাজামহাশয়, মায়ের খোকা হবে। তাইত রাজা খুশি হয়ে গলার হার খুলে দিলেন । রানী বললেন— ওরে, রাজা আজ ণ্ডনলেন ছেলে হবে, কাল শুনবেন মিছে কথা ! আজ রাজা গলায় দিতে হার দিলেন, কাল যে মাথা নিতে হুকুম দেবেন । হায় হায়, কি করলি ? একমুঠো খেতে পাই, একপাশে পড়ে থাকি, তবু বছর গেলে রাজার দেখা পাই, তুই আমার তাও ঘোচালি ? ওরে তুই কি সর্বনাশ করলি ? মিছে খবর কেন রটালি ? এ জঞ্জাল কেন ঘটালি! রানী বললেন— পারিনে বাপু, আপনার জ্বালায় বাঁচিনে, পরের ভাবনা ! রাজা বললেন— সে কি রানী? এমন সুখের দিনে এমন কোথা বলতে হয়? রাজপুত্র কোলে পাব, রাজসিংহাসনে রাজা করব, একথা শুনে মুখ-ভার করে? রানী, রাজবাড়িতে সবার মুখে হাসি, তুমি কেন অকল্যাণ কর? একমাস গেল, দুমাস গেল, দু মাস গিয়ে তিন মাস গেল, রাজা-রানীর ভাব হল না।ঝগড়ায়-ঝগড়ায় চার মাস কাটল। পাঁচ মাসে দুওরানির পোষা বানর রাজার সঙ্গে দেখা করলে। রাজা বললেন— কি হে বানর, খবর কি ? রানী বললেন – আজ আবার কোথা ছিলি? এতখানি বেলা হল নাইতে পেলুম না,রাঁধব কখন? খাব কখন? রানী নাইতে গেলেন । বানর একমুঠো মোহর নিয়ে বাজারে গেল । ষোলো থান মোহরে ষোলজন ঘরামি নিলে, ষোলোগাড়ি খড় নিলে, ষোলশ বাঁশ নিলে। সেই ষোলশ বাঁশ দিয়ে, ষোলোগাড়ি খড় দিয়ে ষোলজন ঘরামি খাটিয়ে, চক্ষের নিমেষে দুওরানীর বানর ভাঙাঘর নতুন করলে। শোবার ঘরে নতুন কাঁথা পাতলে, খাবার ঘরে নতুন পিঁড়ি পাতলে, রাজবাড়ির ষোলো বামুনে রানীর ভাত নিয়ে এল; ষোলো মোহর বিদায় পেলে ! দুওরানী নেয়ে এলেন । এসে দেখলেন—নতুন ঘর । ঘরের চাল নতুন ! চালের খড় নতুন ! মেঝেয় নতুন কাঁথা ! আলনায় নতুন শাড়ি ! রানী অবাক হলেন । বানর কে বললেন—বাছা, ভাঙা ঘর দেখে ঘাটে গেলুম, এসে দেখি নতুন ঘর ! কেমন করে হল ? রাজা বললেন—কি বানর, কি মনে করে ? As she spoke of her sadness, the queen wept floods of tears. The monkey from the forest then climbed into her lap, dried her eyes and said to her, ‘Mother, do not cry! I will rid you of your sorrows, give you a seven storied house, seven gardens of your own and seven hundred maids to look after you; I am not a true monkey unless I manage to seat you beside the king in a temple of gold as his queen, with a son like a sliver of the golden moon. If you do all the things I tell you, you will get back all the wealth and affection you once had. The queen heard what the monkey said and while tears welled in her eyes, her lips curled in a smile. She smiled through her tears and said – My child, I have sacrificed so many things to the gods, and made so many offerings to the holy shrines and I am yet to be blessed with a prince. What prayers will you offer and gain the blessings of which god that you can promise to make me a queen and give me a prince of my own to hold? You, a monkey of the forest? Let it be, my precious! Let my king be happy, let my co-wife be happy, let my sorrows not grow, you do not have to try and accomplish this impossible task! It is late, go to sleep! The monkey protested – No mother, I will not sleep if you do not listen to me. The queen said – Go to sleep, for the hour is late! There are clouds in the east and the west, the rain pours down in torrents, the kingdom sleeps and so must you. I will listen to whatever you say tomorrow, today you must sleep. I have closed the door to my broken room against the storm, I have spread my quilt on the floor against the cold, you are just a child, come to my lap; nestle in my breast and go to sleep. The monkey nestled its head on her breast and slept. The queen rested her head on her faded and torn quilt and went to sleep. The night passed. For the younger queen, it passed in her golden bed, on a layer of flowers by the side of the king; but the older queen spent her night buffeted by rain and wind in her broken down room, lying on her patched quilt. Morning broke. The hours were called by the timekeeper in the palace, the flutes played in the musicians’ gallery and the king and queen rose from their slumbers. The king washed his face in crystal clear water from a golden basin, dressed in his royal robes and descended to the royal court – the younger queen turned on her side on her golden bed on her flower mattress and went back to sleep as her handmaidens fanned her gently with a flowery fan. What did the elder queen do? The golden sun fell through the cracks of the wall on her face and she woke up. She looked this way and that; she searched here and there, but the monkey had vanished. She looked in this room and then the other, she looked in the roof and on the branches – there was no monkey! She began to cry. Where did the monkey go? The monkey had left the sleeping queen in her broken room and had gone to the court as soon as the night lightened in the east. The king was sitting in the court surrounded by his courtiers and ministers, guards at the doors. People milled about. The queen’s monkey pushed through the crowd and managed to dodge the guards and soldiers. He threw himself at the king’s feet and said – Great King, I bring such good news! My mother is with child! The king said – What are you saying! Is this true? The older queen, the sad queen is to have a baby? If you have told me a lie, I will have you both killed! The monkey answered – That is for me to worry about. Now give me a reward, I have to go. The king took off his ivory necklace and gave it to the monkey. The monkey hopped and skipped its way to where the queen was weeping on her torn quilt in her broken room. It dried her tears and dusted off her body and said – Look at what I have brought you mother! You are a queen and yet you wear beads of wood that you have to buy, now you will wear this! The queen looked at the ivory beads in the monkey’s hand and said – Where did you get this? This is the king’s. I made it for the king when I was his queen, where did you chance upon this? Tell me you monkey, did the king throw this upon the dusty street? Is that where you found this? The monkey answered – No mother, I did not find this. Why should I find a present you made for the king in the dusty street? The queen asked – Did you steal it from the king then? The monkey answered – Shame on you, mother! Why would I steal from anyone? I gave the king such good news that the king gave this to me as a reward. The queen declared – You are the child of a sad creature, a monkey from the forest. What happy news could you have heard as you lay in my lap that you had to wake up early and go to the palace? The monkey said – I dreamed that I have a brother, that you have a son; that son will one day be the king of all of this. I ran to tell the king and the king was so happy that he gave me a reward. The queen was frightened – Today you have told him I will have a son, but what of tomorrow when he hears you had lied. Today you have the pearls from his neck but tomorrow he will be chopping off your head. Alas! What have you done! I may eat a handful and be pushed to a corner, but at least I get to see the king once a year and now you have destroyed even that! Why did you do this? Why did you lie? Why did you ruin everything! The monkey said – Why are you worrying mother? Why are you afraid? Just wait for ten months. Let everyone know that the elder queen is going to have a baby. Then when the king comes to see the baby I will give you a son like a sliver of a golden moon and you can show him. Now let us go and eat, I am hungry. The queen said – Let us do that. I have water in a bowl and fruits from the tree, come and eat. She made him sit on a broken plank and served him his food. The king in the meantime went to his younger queen’s palaces. The queen had woken up from a nightmare and was thinking about it as she sat on her golden bed when the king arrived and told her – Have you heard, the elder queen is to have a baby! How worried I have been about who would succeed me to the throne, now I am so relieved! If it is a boy, I will make him king and if it is a girl I will make my son-in-law king and give him my kingdom. I was so worried my queen, but finally I feel at rest. The queen said – I can’t handle this! I have so many issues of my own, and you want me to think of others! The king said – What! Who says such things on a day as happy as this? I am talking about having a son and making him king and you are sulking? Why are you like this when everyone else is smiling with joy? The queen said – I just can’t! I cannot think about whose son is to be king, whose daughter is to get the kingdom and who will get the throne. I have enough hassles of my own, who has the time to think about whether another person’s child lives or dies. All this talking is giving me a headache, let me go and have a bath. She then went away, jangling her eight pairs of bangles and her ten stranded anklets. The king felt very angry for she had said the baby prince could die for all she cared. He came to the outer chambers with a face like thunder. The two had quarreled; from then on, the king never went to see her or the elder queen. He was worried the younger queen would try to poison the older one if she heard of it. He lived by himself in the outer chambers. One month passed and then two. Soon three months had passed but the king and the younger queen had not forgiven each other. Four months went thus. In the fifth month the monkey came to see the king who asked – Monkey, what is the news? The monkey said – My mother is suffering so much! She cannot eat thick rice grains and her health suffers from her not eating a thing for the past few days. The king declared – What! I knew nothing of this! Minister, go at once and send the finest rice, fifty kinds of accompaniments in golden plates and bowls to the elder queen. From this day on wards, my elder queen eats whatever I eat! Give the monkey a thousand coins before he goes! The Minister paid the monkey and went to the kitchens. The monkey took the coins to his mother the queen. The queen asked him – Where were you today? You are so late, I have not had time to bathe and now I will have to go hungry. The monkey answered – Mother, you will not have to cook for us any more. Soon the royal kitchens will send golden plates full of rice and golden bowls filled with fifty different accompaniments, go and bathe quickly. The queen went to bathe. The monkey now went to the markets with a fistful of coins. He used sixteen coins to hire sixteen builders, sixteen loads of straw and sixteen hundred bamboo poles. Those were used by the sixteen builders to repair the broken house and to thatch its threadbare roof. He bought new quilts for the bed, a new wooden seat for the dining room and gave sixteen coins to the sixteen Brahmins who brought the queen her food from the royal kitchens. Duyorani came back from her bath. She saw that the house was repaired, the newly thatched roof had new straw. On the floor lay new mats and quilts; on the line hung new clothes for her. She was astonished and said to the monkey – I went to bathe from an old broken house and now it is all new! How did this happen? The monkey said – Mother, the king has given me gold coins. I paid for repairs to the room, darning for the quilt, a proper wooden stool; come and eat hot rice from a golden plate and drink warm milk from a golden bowl! The queen sat down to eat. She ate rice from a golden plate after such a long time, she rinsed her mouth from a golden cup and even ate a mouth freshening pan from a golden container; but she could not feel happy. The queen ate her royal meals and thought – Today I eat from a golden plate, perhaps tomorrow the king will have my head on a platter. One month passed cautiously, then two and then three. The queen’s new rooms were now old, the new thatch had holes once again and the straw from the roof flew freely here and there. The monkey went to meet the king again. Hello monkey, what is the news? The king asked. The monkey said – Can I speak freely or must I watch what I say? The king answered – Speak freely! স্ফটিকের সিংহাসনে রানীর পাশে বসে বললেন—এই নাও, রানী! মানিকের দেশে মানিকের ঘাট,মানিকের বাট—সেখান থেকে হাতের চুড়ি এনেছি। সোনার দেশে সোনার ধুলো, সোনার বালি—সেখান থেকে পায়ের মল এনেছি । মুক্তোর রাজ্যে মুক্তোর পা, মানিকের ঠোঁট, দুটি পাখি মুক্তোর ডিম পাড়ে । দেশের রানী সেই মুক্তোর হার গাঁথেন, রাতের বেলায় খোঁপায় পরেন, ভোরের বেলায় ফেলে দেন । রানী, তোমার জন্যে সেই মুক্তোর হার এনেছি। রানী, এক দেশে রাজার মেয়ে এক-খী রেশমে সাত-খী সুতো কেটে নিশুতি রাতে ছাদে বসে ছ’টি মাসে একখানি শাড়ি বোনেন, এক দিন পরে পূজো করেন, ঘরে এসে ছেড়ে দেন । রানী, আমি সেই রাজার মেয়ের দেশ থেকে সাত জাহাজ সোনা দিয়ে রাজকন্যার হাতে বোনা শাড়ি এনেছি। তুমি একবার চেয়ে দেখ ! পৃথিবী খুজে গায়ের গহনা, পরনের শাড়ি আনলুম, একবার পরে দেখ ! রানী তখন দু’পায়ে দশ-গাছা মল পরলেন; রাঙা পায়ে সোনার মল আল্‌গা হল; দু-পা যেতে দশ-গাছা মল সানের উপর খসে পড়ল। রানী মুখ ভার করে মুক্তোর হার গলায় পরলেন ; মুক্তোর দেশের মুক্তোর হার রানীর গলায় খাটো হল, হার পরতে গলার মাস কেটে গেল। রানী ব্যথা পেলেন ! রাজা এসে বললেন—মন্ত্রীবর, আশ্চর্য হলুম ! মাপ দিয়ে ছোটরানীর গায়ের গহনা,পরনের শাড়ি আনলুম, সে-শাড়ি, সে-গহনা রানীর গায়ে হল না ! একদিন বানর বললে—হ্যাঁ মা,তুই কাদিস কেন? তোর কিসের দুঃখ ? রাজবাড়ির দিকে চেয়ে চেয়ে কেন কাঁদিস, মা ? ওখানে তোর কে আছে? রানী বললেন—ওরে বাছা,ওখানে আমার সব আছে আমা্র সাতমহল বাড়ি আছে,সাতশ দাসী আছে,সাতসিন্দুক গহনা আছে, সাতখানা মালঞ্চ আছে। আর বাছা, ওই সাতমহল বাড়িতে রাজার ছোটোরানী আমার এক সতীন আছে। সেই রাক্ষসী আমার রাজাকে জাদু করে আমার সাতমহল বাড়ি, সাতশ দাসী, সাত সিন্দুক গহনা কেড়ে নিয়ে ওই ফুলের মালঞ্চে সোনার মন্দিরে সুখে আছে; আমার সর্বস্বধন রাজাকে নিয়ে আমায় পথের কাঙ্গালিনী করেছে। ওরে বাছা, আমার কিসের দুঃখ! আমি রাজার মেয়ে ছিলুম, রাজার বৌ হলুম, সাতশ দাসী পেলুম, সাতমহল বাড়ি পেলুম, মনের মত রাজস্বামী পেলুম। সব পেলুম তবু কে জানে কার অভিশাপে, চিরদিনে পেলুম না কেবল রাজার কোলে দিতে সোনার চাঁদ রাজপুত্র! হায়, কতজন্মে কত পাপ করেছি, কত লোকের কত সাধে বাধ সেধেছি, কত মায়ের প্রাণে ব্যথা দিয়েছি, তাই এজন্মে সোনার সংসার সতীনকে দিয়ে, রানীর গরবে, স্বামীর সোহাগে, রাজপুত্রের আশায় ছাই দিয়ে পথের কাঙ্গালিনী হয়েছি! বাছারে, বড় পাষাণী তাই এতদিন এত অপমান, এত যন্ত্রণা বুকে সয়ে বেঁচে আছি! The golden ship unfurled its golden sails and sailed across the endless blue waters of the sea towards the west like a golden cloud. The Duorani lay on her tattered bed in her broken down room and gazed towards the blue sea. The beloved Shuyorani fell asleep on her golden bed, listening to the golden plumed song birds in their golden cages as she thought of the jewellery she would soon have and her seven hundred hand maidens sat about her. The king too forgot his sorrowful elder queen as soon as he boarded the ship. All he remembered was the smiling face of the younger queen on the day he had left her. He thought of her all day; what was she doing then? Perhaps she was doing her hair. What was she doing now? She must have been colouring the soles of her feet; now she must be collecting flowers now from the seven gardens to make garlands from seven baskets filled with blooms while she thinks of me. As she remembers me, her eyes well with tears and the garlands never get made. The golden thread and the basket lie at her feet; she sits there sleepless with worry. The young Shuyorani is his one love, he only thinks of her. He never once remembers the older queen, the one who is madly in love with him. The king spent twelve months at sea roaming various lands. In the thirteenth month the king came to the land of the rubies. In the land of rubies everything was made of that precious stone. The walls were made of stones as were the steps by the river and the gravel on the streets. The king had bracelets made for his younger queen. The eight thousand stones on her eight bracelets glowed red like droplets of blood on skin. With the bracelets of rubies, he journeyed to the land of gold. He bought ten pairs of solid gold anklets from the gold smiths of the land. The anklets shone like molten fires, they rang against each other like the tinkling of cymbals and the flourish of veenas. After he had bought the ruby bracelets from the land of rubies and the golden anklets from the land of gold his ship arrived in the land of pearls. The king of the land had two pigeons in his gardens. They had feet of pearl and beaks of rubies with which they plucked pearl fruit from emerald trees and laid pearl eggs. His queen made garlands in the evening from those eggs, dressed her hair with them at night and threw them away each day at dawn. Her maids took those cast offs to sell them at the markets for a ship filled with silver. Our king bought one of those necklaces with a ship’s cargo of silver for the slender throat of Shuyorani. Six months after he had bought the bracelets of rubies, the anklets of gold and the necklace of pearls, the king arrived in a new land. In the pleasure gardens of the princess of that land, blue silkworms grew upon sapphire trees. They fed on blue leaves and wove cocoons of blue silk that was as silky as water, as light as the air and as blue as the sky. The princess sat upon her roof all night and wove a blue sari to match the colour of the sky above her. Each sari took her six months. The princess wore the sari which was as silky as water, as light as the air and blue as the sky on the day that she worshipped at the temple of the blue throated god Lord Shiva. When she came home from the temple she discarded the sari on the floor and her handmaidens sold it to anyone who could pay them with seven ships filled with gold. Our king bought this sari for his beloved with seven ships worth of gold. Six more months passed after that and then the seven ships traversed the seven seas and the thirteen rivers and came back to his own country with rubies for the queen’s arms, gold for her ankles, pearls for her neck and a sari as blue as the sky for her form. Now the king remembered that Duorani had asked for a monkey. The minister went off in search of a monkey. The king rode on a white elephant along streets filled with cheering subjects and went to the palace with all the jewellery and the sari for the younger queen. She was sitting in the palace with the seven floors, on the seventh floor. She had a golden mirror before her and she combed her hair with a golden comb, tied it with golden cords and fixed it with pins of gold before using a golden nib to paint a dot between her eyebrows. She then drew kohl lines on her eyes, applied red dye to her feet and allowed her handmaidens to tend to her with flowers and trays of mouth freshener. The king came to see her there. He sat by his queen on a crystal throne and said, ‘Here is what you asked for, my queen! In the land of rubies, the very steps are made of rubies! From there I have brought you bracelets for your arms. In the land of gold the very dust is made of gold! From there I brought you anklets for your feet. In the land of pearls the pigeons with feet of pearls and beaks of rubies lay eggs of pearl. The queen makes necklaces from them, wears them at night and throws them away at dawn. From there I bought them for you. In another country the princess weaves seven measures of silken thread from one measure of silk and sits up at night for six months to make herself a sari. She wears this for a day and never touches it again. I bought that sari for seven ships filled with the yellowest gold, so that you might have it. Here it is! I have roamed the world to bring you jewels for your throat and silk for your skin, wear them once, for me. The queen then pulled the eight bracelets over her hands but the rubies hung limply against her arms and the bangles rode all the way to her shoulders. She drew the anklets on to her feet but they were loose about her ankles; as she walked but two paces, they fell off her feet with a clanging sound. She sullenly fastened the pearl necklace around her throat; but the pearls from the land of pearls were too tight around her neck and cut into her flesh, hurting her. She wore the sari after wrapping it around herself seven times but the blue silk sari was too short for her. Tears welled in her eyes. The petulant young queen then pulled off the bracelets with their eight thousand rubies, the solid gold anklets, the pearls about her throat and the treasured sari! She said – Fie on these jewels, this sari! Where did you get the pebbles to make these bracelets? Where did you gather the dust to make these anklets? Shame on you for bringing me someone else’s cast off pearls! I hate the sight of this used sari, I am ashamed to wear them all! Take these away king, for I have no use for these old things! The queen then locked herself in her chamber of anger and sulked. The king grew sombre and brought the sari and the jewels he had bought with seven ships filled with gold to his court. The minister sat waiting by the king’s throne with a baby monkey that he had bought from a merchant from the land of magic for just a coin. The wild monkey then paid his respects to the king and said – Only the very fortunate are allowed to wear what the daughters of gods and snakes weave and make for themselves; these jewels and saris from the lands of make-believe. Put these away in the royal treasury, give them to your daughter-in-law when she comes into the family. The minister went to the goldsmith to order new jewels for the young queen. The king went to the older queen with the monkey she had wished for. The king’s eyes filled with tears when he heard her words. He gave her the monkey child as he sat in her broken room upon her tattered quilt. He said, ‘My queen, your tattered rags and broken doors are a million times better than the other queen’s thrones and rooms of gold. There is kindness and compassion here, there are sweet words to be heard; she has none of that. She kicks away the jewels I bought and the sari I gave her. Yet, you are embracing the monkey I gave you which did not cost anywhere near that amount. I will not be the cause of your sorrow any more. Bid me farewell, I will return to you again, my queen. But beware, let not the young queen hear of this. She will not rest if she hears of this; she will either poison you and kill me. The king went away after consoling the queen. She continued to live in her broken room raising the monkey on milk and bananas. The days passed, as days always do. The younger queen spent her days in the palace with the seven floors surrounded by seven hundred hand maidens; while the older queen lay on a tattered rag in her broke down room, hugging a monkey to her bosom. Days became months and months turned into years. The older queen’s plight did not change; she had coarse rice to eat and coarse clothes to wear. She lay on her broken room, clutched her only companion the monkey to her breast and wept as she looked at the palace and its seven gardens. The monkey always saw her with tears in her eyes.